Add the Sawtooth Mountains to the list of views I’ll never forget. There is something magical about driving on a road and suddenly you get a stellar view. It can be of mountains or a skyline or water or a big valley. 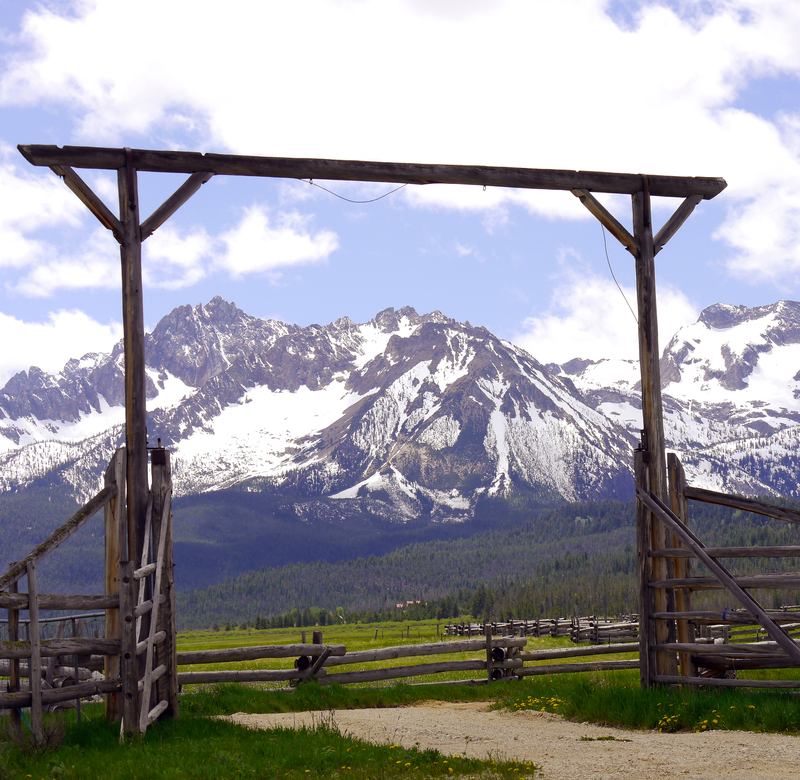 The Sawtooth Mountains framed by a ranch entrance. On a recent camping trip near Stanley, Idaho, we were rocking along Highway 21, driving through a pretty thick forest when we drove up over a hill and before us was a large valley with a stream running through it and the tall, craggy peaks of the Sawtooth Mountains looming above it all. 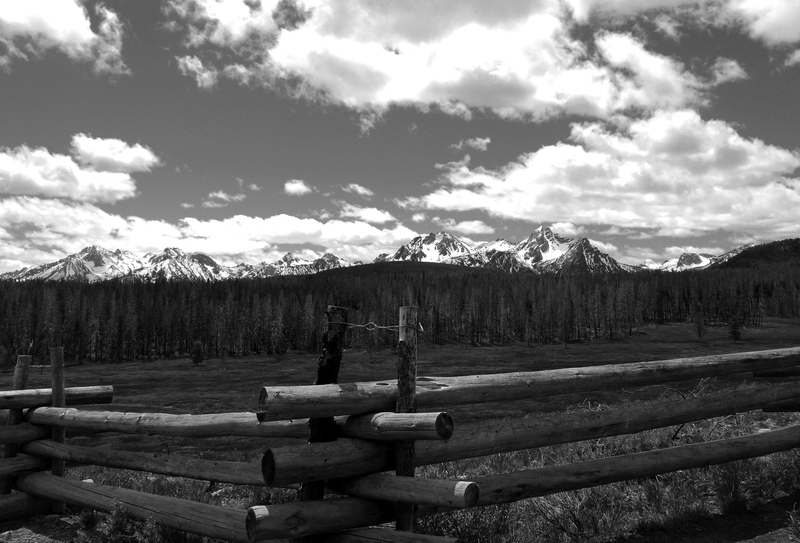 I’ve never been to the Grand Tetons in Wyoming, but the Sawtooths surely give them a run for their money. 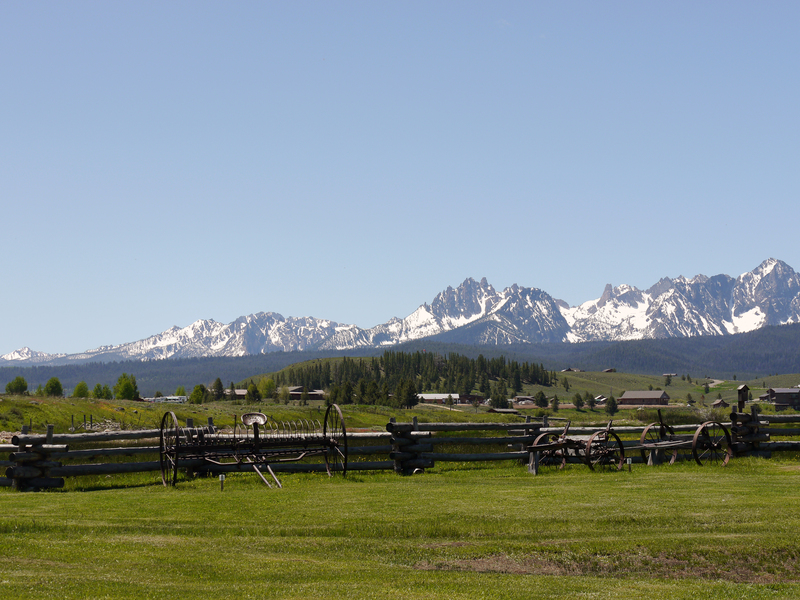 The Sawtooth Mountains with some old farm equipment in the foreground. It was the most startling, stunning view I’ve seen in quite some time. Comparable to when you are driving up to Paradise at Mt. Rainier and after seeing peeks and snippets of the Mountain, you turn a corner and it is just suddenly there in all its glory. While Rainier is awe-inspiring in its size, the Sawtooths provide a backdrop to a beautiful valley with the Salmon River running through it. The tiny town of Stanley (population 63) gives you the feeling of being alone, not fighting tons of tourists for the views. 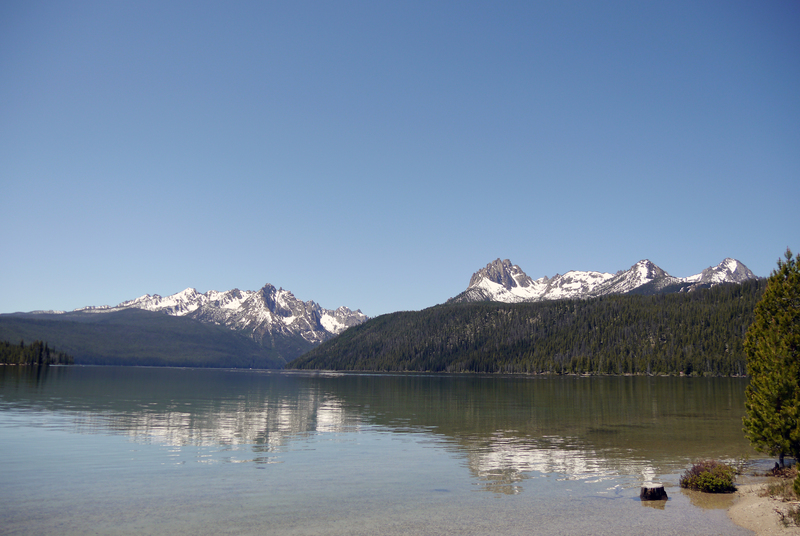 The Sawtooth Mountains reflected in Redfish Lake. It seems impossible to take a bad photo of the area. We framed the mountains with the entrance to a ranch; grabbed a shot of a lonely road traversing the valley; with them reflected in Redfish Lake; with some antelopes in the foreground; and many, many more. While our camping trip in the area was cut short by extremely cold June weather, the trip was still worth it just to soak in the views of the mountains. This was our first view of the Sawtooths on our drive. Not a bad rest area view. Stanley has a couple of hotels and lodges in it, which means you don’t even have to suffer through camping to visit this amazing place. Plus, it was only three hours from our front door. Not bad. The initial view of the mountains brought back not just memories of Rainier, but also when I visited Chicago as a youngster. Driving in from Indianapolis, I remember coming over a rise in the freeway and seeing the iconic skyline in the distance. 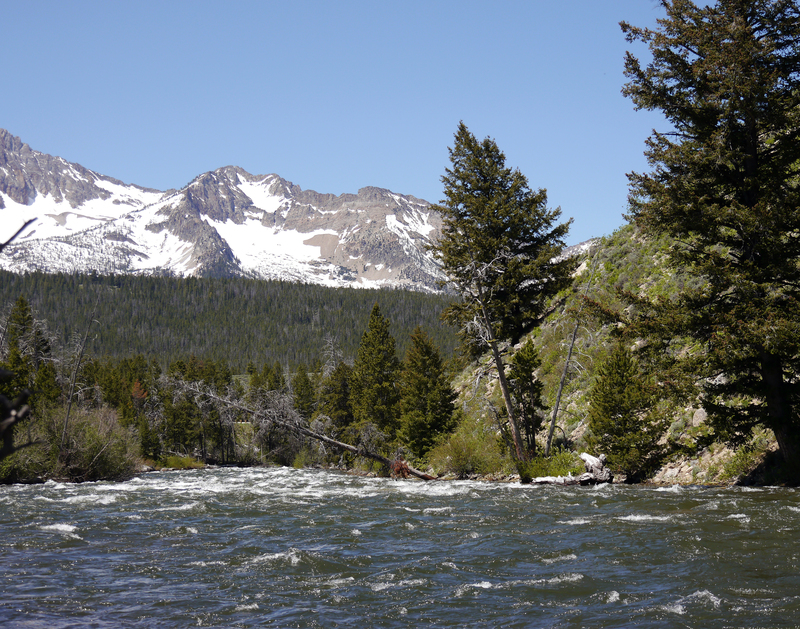 The Salmon River raging with the Sawtooths in the distance. Another favorite view is heading west out of Ellensburg and seeing the Swauk Valley with the Enchantments in the distance. Or after going over the Umtanum ridges heading east into Yakima on I-82 and seeing Mt. Adams – and a distant Mt. Rainier – looming in front of you. Frankly, there are too many amazing views to name. But trust me, if you want to see one of the best – drive to Stanley from Boise and you will have your breath taken from you. cool pictures. i’ll expect you to be my tour guide some day.